Texas Sedation Dental & Implant Center has taken another step to improve the patient experience in our office by investing in CEREC technology. What does this mean for our patients? We can now offer long lasting, highly aesthetic all-ceramic crown restorations in just one visit with no need for impressions. That also means no two to three week wait between the crown prep and the seating of your permanent crown; so there is no need for temporary crowns either. What is a traditional crown? For traditional crowns, the dentist first makes an impression of your tooth or teeth. Then, depending on what would be most beneficial for your mouth, a choice is made between porcelain, metal or porcelain fused to metal to make the most suitable crown. The tooth impressions are then sent off to a lab which prepares the custom-made crown. This can often take several weeks and it often will be necessary to adhere to dietary restrictions so as not to damage the temporary crown that has been put into place. CEREC is a sophisticated CAD/CAM system for the production of all-ceramic inlays, onlays, partial crowns, veneers and crowns for anterior and posterior teeth. The CEREC procedure was developed at Zurich University and has been in use in dental practices for more than 25 years. The CEREC system is in use in more than 25,000 practices and in over 50 countries. Since 1985, over 8 million patients have been treated using the CEREC system and more than 20 million ceramic restorations have been created and placed. CEREC crowns, also known as same-day crowns, are made of ceramic and require a protracted amount of time to place compared to that of traditional crowns. They are prepared using a unique intra-oral camera which creates 3D images of your tooth. This allows the dentist to skip the more tedious and messier step of making a full impression of your teeth as would be necessary with traditional crowns. A milling machine is then used to carve out a near-identical replica of the 3D image out of a single ceramic block. A few minutes later and the dentist is able to adhere the CEREC crown to your tooth. The most distinct advantage is the immediacy of them. CEREC crowns save you both time and money as the procedure can be completed in full with only a single office visit, getting you on your way with a restored smile in less time than you probably expected. 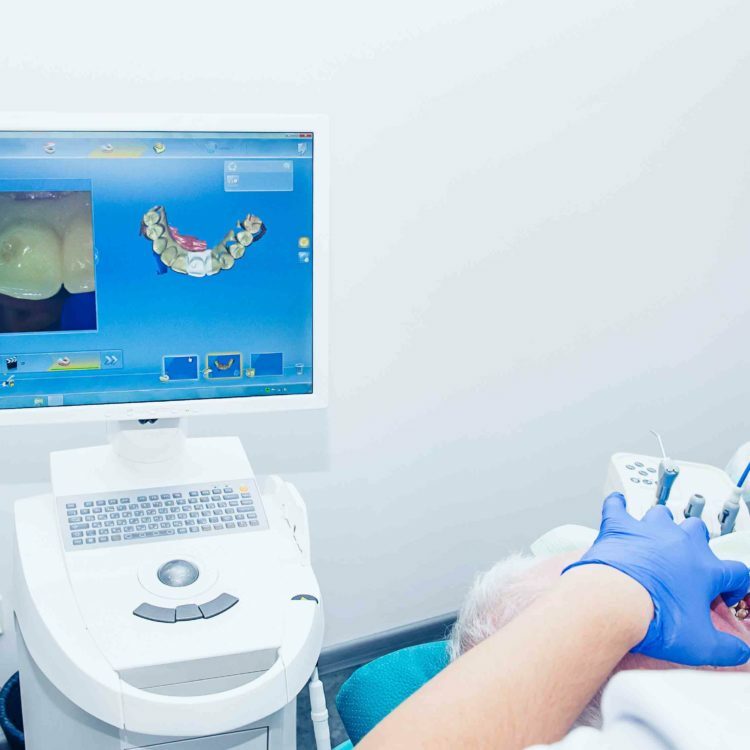 The process for obtaining a CEREC crown is more comfortable than for a traditional crown as there’s no having to sit through the process of making an impression. What are the disadvantages of CEREC crowns? There is no denying the convenience of CEREC crowns, particularly when it comes to the speed at which they can be placed. However, there are some downsides. Most notably, the metal crowns that can be chosen for traditional crowns are stronger and less likely to succumb to fracturing or wear and tear over time. The alloys metal crowns are composed of also allow the crown to have a stronger bond with the tooth, increasing their resistance. Additionally, should you suffer a fracture below the gumline, a CEREC crown may not fit as well as a traditional crown would. What to Like About the CEREC procedure? No conventional impressions: The CEREC 3D measuring camera scans the tooth after it is prepared by the dentist in just a few seconds, which eliminates the need for unpleasant impressions. No temporaries: CEREC restorations are milled out of a solid block of ceramic in just a few minutes and are then ready to be placed immediately. This eliminates the need to have a temporary placed while you wait for a dental lab to manufacture your permanent crown. No long waiting periods: Because CEREC restorations can be placed immediately, you need only one appointment. Further, you benefit from tooth restorations that have demonstrated their durability. We are excited to be able to offer this excellent new service featuring high-quality material produced with the latest technological upgrades. We know that it can be unpleasant and frustrating to find out a new crown or other restorative is necessary. Especially so if that also means coming back for additional appointments over the course of several weeks. We are confident you will be satisfied no only with the level of additional comfort from this procedure but also, more importantly, with the quality and durability of your restoration. We look forward to seeing you in the office and hearing your feedback on this new service! Schedule a consultation.